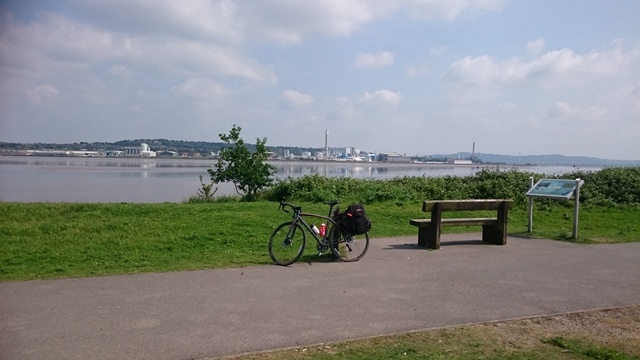 In June this year I rode from Southport to Hull along a largely off-road and traffic-free route. 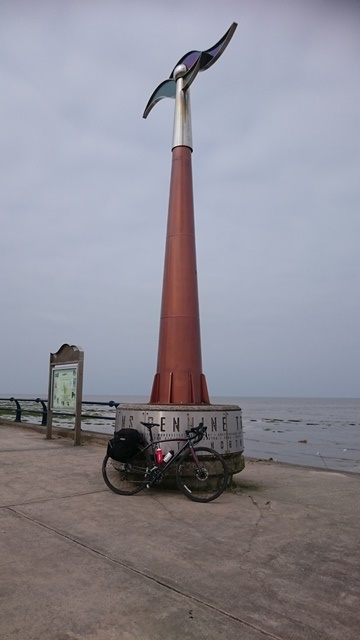 Also known as the Transpennine trail this 215-mile sign-posted ride starts from the seaside town of Southport in Merseyside, in the north-west of England, and finishes in Hornsea, another seaside town on the East Yorkshire coast. 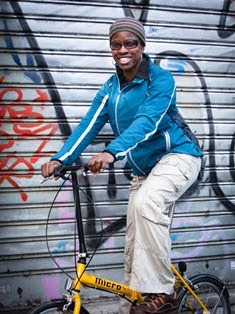 Given that I have read accounts of people of all shapes and sizes doing this ride I thought it was about time I had a go. So, with the help of some wheels on my Raleigh Mustang Sport gravel bike, and with a few panniers loaded on it I caught the early train up to Southport. But today it just looked like tired old coastal town - still popular with the youngsters, and a way for mums to keep the kids from under their feet for a few hours. Sadly, Southport is also popular with a few drunkards and ne'er do wells, as I found when I was trying to take photos of the Marine Way Bridge! Still, I had no plans to hang around as I had an itinerary to get through and needed to be in Macclesfied that evening. 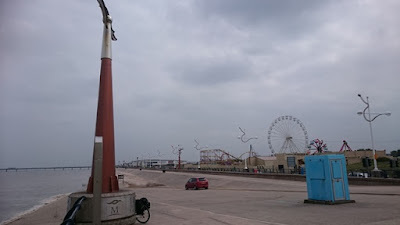 As Southport is not very big (but then that's what I think of most towns, coming from London!) I was quickly in a new area with a different kind of landscape. This first part of the ride was parallel to the coast with sand dunes nearby. It also overlapped with the Sefton trail, a long distance walk where there were quite a few walkers and runners out on this sunny morning. 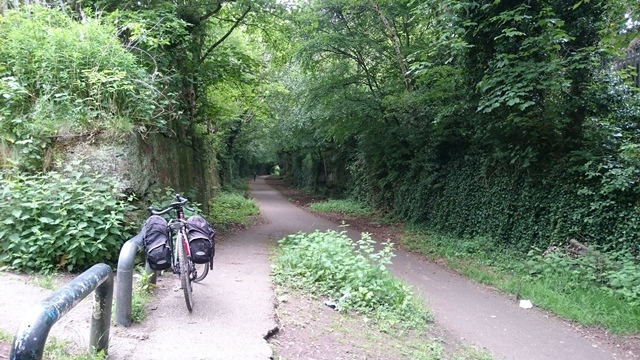 Next the route went along the Cheshire Line, an old disused railway line through fields. I came across quite a few runners along this route, but nothing else. Given that it was a pleasant day it was strange to not see other riders along the way. I hadn't gone the wrong way had I? Regular signs with "TPT" writing on them showed me that I was on the right track. As someone who has written about cycle routes along disused railway lines I am always on the look-out for new lines. 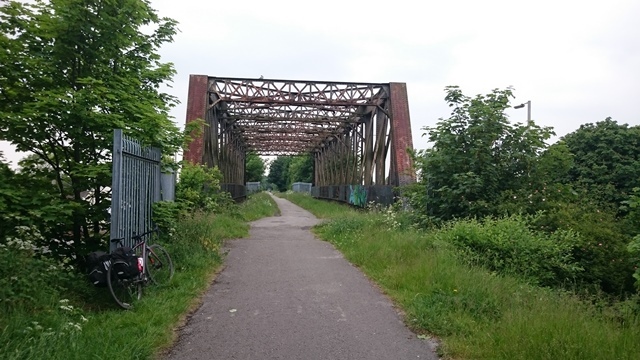 The Cheshire Lines path is one to keep in mind for the future, and one that I would recommend if you are looking for a real getting-away-from-it-all traffic-free bike ride. There are no cars, no animals, hardly any people - also, no refreshments so stock up before going along this long stretch. This disused railway line eventually took me into urban areas and at that point I realised I was on the outskirts of Liverpool, in the area of Netherfield. After a pleasant ride along a canal, albeit peppered with graffiti and broken glass, I arrived at Aintree - quite ironic to be at the home of the Grand National on the day that the other famous UK horse race, the Epsom Derby was taking place just 10 miles from my home. Up until this point signage had been quite clear, but as I ventured further and further into Liverpool I was losing more time stopping and looking at maps. Maybe it was a conspiracy to not let me out of here! I wasn't going to let any amount of spinning around the city stop me moving further, so I pressed on through this frustrating section of the ride. Eventually, navigation became easier thanks to reaching another disused railway line. Ah, another chance to just sit there, pedal and follow the path in front of me. Cue, the Liverpool Loop Line. 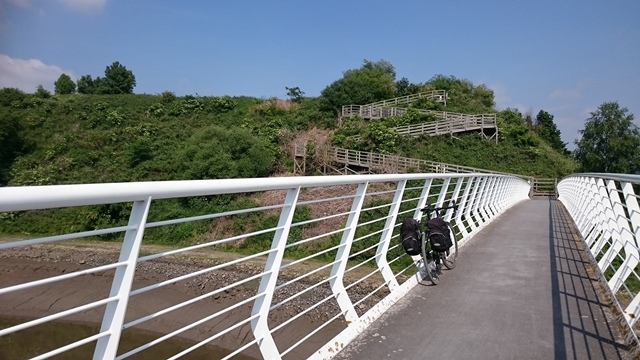 This is a great little commuter path that runs the length of Liverpool, allowing you to ride to other parts of the city. As the path is tarmacked it was also a chance to pick up a bit of speed after having spent the morning on rough stuff. Initially the landscape is just a bog standard urban park with lots of remnants from Liverpool's industrial past. There are iron bridges, old railway signs and disused factory plants. Further along, the scenery became scenic with a lot of recreational walkers and cyclists in this area known as Halewood Park. People were very friendly, with many people saying hello - walkers, joggers and cyclists alike. If I had stopped to look at my Ordnance Survey map (just to study the area a bit better) people automatically approached me and asked if I needed any help finding my way. Even when I just stopped at the side of the path people took the time to ask if I was okay. The people of Liverpool definitely have a warmth and kindness about them that I haven't seen anywhere else. I liked people talking to me too, because I really dig the Merseyside accent! Once off the Liverpool Loop Line, it was back to stopping and checking maps again as I went through another network of roads that took me down to Speke, a pretty run-down, depressing neighbourhood that backed onto a lovely bijou village, Hale. These two areas were like night and day. The one thing they had in common though was living under the same low-cost skies - being right in the flight path for the John Lennon Airport meant Easyjet and Ryanair planes pass overhead every few minutes. I couldn't help noticing the massive contrasts in Liverpool - the folks loitering along the Liverpool Line versus others jogging along it with an exercise mission, modern buildings set against old industrial relics, impoverished council estates alongside affluent villages, and the Mersey Estuary where the most beautiful nature park and picnic area sits right opposite a large industrial and chemical plant at Runcorn. Saturday afternoon leisure right opposite Saturday afternoon graft! So many opposing aspects side by side in perfect harmony! That's Liverpool! Talking of graft, this section of the ride was the hardest for me. The first day on the Transpennine Trail is characterised by two things: firstly, a lot of broken glass throughout the urban areas so use decent tyres and make sure you are stocked up on inner tubes! Secondly, there are lots of gates and obstacles to pass through that aren't designed for a bike with 10kg of panniers! I therefore ended up having to lift my bike a number of times. It was slightly inconvenient having to dismount and squeeze my bike through a narrow gap, but when it came to carrying the bike up long staircases that was no joke! Getting onto the Liverpool Loop Line from the main road at Aintree involved climbing up a narrow staircase that had around 30 steps. Once onto the path I was boiling hot and definitely needed a breather. That was bad enough, but this other set of steps along the Mersey Estuary Trail up to Widnes was something else! Basically it was a zig zag wooden staircase that seemed to carry on forever. When I first caught sight of the steps in the distance I refused to believe that my route was going to take me up to that place 30m above me! No way! But as I drew nearer to it, my lovely twisting meander through the nature reserve became tinged with the harsh realisation that I would have to surmount this beast! Riding up it was out of the question. So the only way I could do it was by removing my panniers, leaving them on the ground, carrying the bike a few steps up to the first zigzag, leaving the bike at the zigzag, going down the steps to fetch my panniers, bringing them up to the first zigzag and leaving them on the ground, then carrying the bike up to the second zigzag, leaving that to go and pick up my panniers and bring them to where the bike was. Yes, that was the only way I could do it and it ended up as tedious a process to do this, as it is to write it now! With six zigzags I ended up being stuck on that bridge for a wee while! Those who do cyclo cross and in particular the Three Peaks cyclo cross challenge, this makes for great ideal training! I can't say much more about the ride as it was all pretty non-descript, or maybe it was scenic but the fact is I was just too busy recovering from my zigzag ordeal! Then all the broken class caught up with my tyres and I got a puncture! Feeling a bit worn out, and being conveniently positioned near a local Halfords store I let the mechanic take the strain, and like a professional bike rider I got a support team to sort out my bike! Shamefully lazy, I know! Puncturing put a little a blemish on the ride, but the real downer was the storm that I got caught in just outside Warrington. It had been a beautiful summer's day and everyone was enjoying being out at the marina, as I rode along the St Helen's canal. Then suddenly the sky turned black and the heavens opened out of nowhere. All the folks at the local country pub had to quickly pack away the barbecue and round up their kids and animals, not to mention their pints and take shelter indoors. Those that couldn't fit into the compact lounge ended up huddling up in the conservatory, and I joined them as we all talked about the great British weather while willing the rain to stop some time soon. After around 20 minutes I decided to take the plunge - literally, as the rain was still coming down but I decided my best bet at this time of the early evening was to ride the five miles to Warrington train station and complete my journey to Macclesfield that way. 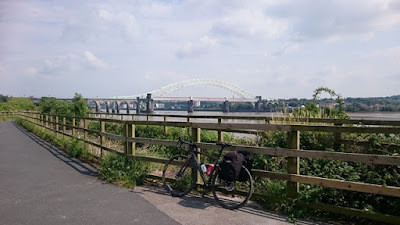 For me, it wasn't a problem missing out the stretch of Transpennine trail between Warrington and Stockport. 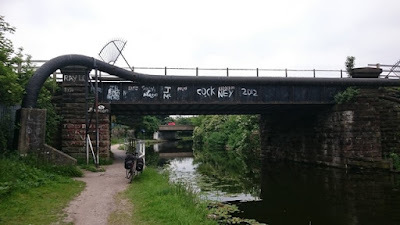 I had done a good stint of riding (and carrying my bike) for the day and I had had my fill of nature trails and industrial monuments so I was glad to be whisked to the B&B in my old stomping ground of Macclesfield. It had been a fun day with a lot of variety and I looked forward to the sights along the way for the following day.